Highland commercial embroidery machines and chenille machines from MESA offer state-of-the-art features that won't break your budget, including large sewing areas, unbreakable reciprocators, smart thread-break sensors, and laser design tracing. You won't find a better value in the industry. Every new embroidery machine or chenille machine purchased from MESA includes training and service plus toll-free phone support, and is covered by the industry's most comprehensive 5 year warranty. Starting a new business or adding embroidery to your existing business? MESA makes it easy with money-saving Embroidery Business Startup Packages. Embroidery Business Startup Packages are designed with the new business owner in mind and include everything you need to start using your new embroidery equipment right away, including embroidery software, thread, bobbins, backings and more. MESA offers 4 models of single head embroidery machines: the 1201 Echo 12 needle compact embroidery machine, the 1201c 12 needle compact, the 1501C 15 needle compact embroidery machine, and the 1501U full-sized 15 needle bridge-style embroidery machine. All four models feature continuous high-speed embroidery, a large sewing area, a large touch-screen control panel, and tons of features designed to save you time while producing beautiful embroidery. Multihead embroidery machines help you achieve high production for higher profit potential. 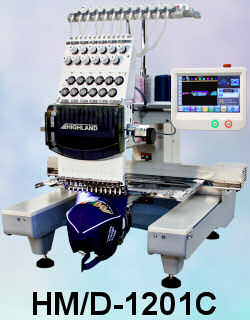 MESA offers 2-head compact embroidery machine, 4-head, 6-head, and 8-head embroidery machine models. Each model features a heavy duty frame built to last and minimize vibrations and noise, and also includes touch-screen control panels, thread-break detection, laser design trace, and more. The compact six-color chenille machine is the only one of its kind in the United States, and offers chenille at not only a low start-up cost, but also in a compact design to fit into even the smallest shops. We also offer the combo chenille embroidery machine, which features chenille and embroidery heads all on one machine.